The Livingston Systems patent pending Tag Along™ platen allows for printing of a t-shirt neck label and the front of the t-shirt in one step. Concurrent printing of labels saves time and money by removing secondary operations and equipment. Whether you are looking to customize your clothing line or meet CPSIA label regulations, the Tag Along™ platen attachment is your solution. 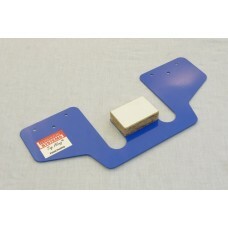 The Tag Along™ platen opens options of creativity previously unavailable without notable cost. Labels produced with a secondary screen printing operation or pad printing requires extra handling, curing, materials, and equipment. Multi-color labels produced on the Tag Along™ are now hardly any more effort that printing the front of a standard t-shirt. The Tag Along™ only requires your current screen printing press and a flash dryer to unleash the possibilities. Do You Require a Bracket?